$5 Off First Box Orders with Email Sign-ups at Edible Blooms Save $5 on your first box when you shop at Edible Blooms today and sign-up! Discover Easter Gifts from $49 at Edible Blooms This Easter, shop at Edible Blooms for all of your chocolate delights! Up to 50% Off Orders in the Autumn Sale at Edible Blooms Check out the Autumn sale now on at Edible Blooms where you can save up to 50%! Free Delivery on Orders Over $120 at Edible Blooms Get fast and free delivery straight to your door when you spend $120 or more! Romantic Gifts from $39 at Edible Blooms Give the gift of romance in a wonderful treat from Edible Blooms. Wedding Anniversary Gifts from $45 at Edible Blooms Are you looking to surprise someone for their special day? The wedding anniversary range at Edible Blooms will definitely make that happen! Great Father's Day Gifts from $29 at Edible Blooms Edible Blooms are offering fantastic Father's day gifts from only $29! Mother's Day Gifts from $39 at Edible Blooms From only $39, you can treat your mum to an Edible Blooms gift. With more than a decade in the business, Edible Blooms has made quite the name for itself, offering incredible products that you can’t get anywhere else. Edible Blooms is a company quite like no other, offering a range of chocolate flowers lovingly crafted by skilled artisans and filled with home-baked yumminess and classic, indulgent favourites like Lindt, Ferrero Rocher and luxurious Belgian chocolate. There’s something for everyone with Edible Blooms, with variational options including beer, wine, nuts, , there’s even choices for the football fanatics amongst us. If you’re looking for a more substantial present, Edible Blooms’ range of gift hampers make the perfect gift for a special occasion, with alcohol-heavy options accompanying chocolate, cheese, and seasonal specials. Ideal a big birthday or a special occasion like an anniversary or a graduation, these hampers are chocka-block full of goodies. Whoever you’re buying a present for, and whatever the occasion, you’ll find something special to express how you feel with Edible Blooms. How do I use my Edible Blooms discount code? Sign up to Edible Blooms’ mailing list and be amongst the first to hear about savings, deals and discounts. Does Edible Blooms offer free delivery? Edible Blooms offers free next-day delivery on all orders! What if my my Edible Blooms purchase melts during delivery? Edible Blooms has a few tricks up its sleeve to ensure your purchase arrives with you in perfect condition, however if your purchase has melted or been damaged in transit, take a photo of the damage and email it to fresh@edibleblooms.com.au and they will endevaour to resolve the problem. Is there a Edible Blooms near me? You can find your nearest Edible Blooms store here. Find the opening hours of your local Edible Blooms here. The seeds of Edible Blooms were planted back in 2005 by two sisters with a shared love of great gifts. They wanted to provide Australians with the perfect one-stop-shop to find fabulous presents, and more than a decade later it’s safe to say they’ve achieved that goal! Shop with an Edible Blooms discount code and save a pretty penny on one of these wonderful gifts, whoever you’re shopping for. From sweet treats to pretty plants, there’s something for everyone at Edible Blooms. You can shop for your gift depending on the occasion, meaning you can find the exact right product for the moment. Find something respectful as a sympathy gift, something romantic for valentines or an anniversary, something festive for christmas, something spooky for Halloween or something fun for birthdays. Whatever the occasion, you’ll find an amazing array of options at Edible Blooms. There’s even choices for stag and hen dos, and gluten-free options for the coeliacs out there. The clue’s in the name, so if you want to discover what Edible Blooms’ does best, look no further than it’s fantastic range of chocolate flowers. Perfect for sweet teeth and flower enthusiasts, these delightful delicacies are sure to put a smile on a loved one’s face. 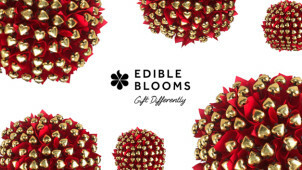 Shop with an Edible Blooms promo code and see how much you can save. From roses to gladioli, there’s a vibrant selection of bouquets to choose from, so when you’ve got something to say, say it with (chocolate) flowers.